For such a long time, I did not visit KL Tower. Yes, I see it everyday but it didn't come across to me, that it is not just a tourist spot or "lambang" Malaysia, our nation. Oh boy, I am not disappointed with one of my recent visit for buka puasa session! The food is kampung inspired and beautifully selected and crafted by Chef Ismail! All of us taking one for the memorable and awesome dinner at KL Tower with the organizing team, media and bloggers! From now till 3 July, spend wonderful time with your family and friends at KL Tower Ramadan Buffet (from 6.30pm to 10.00pm) at Mega View Banquet Hall, KL Tower. 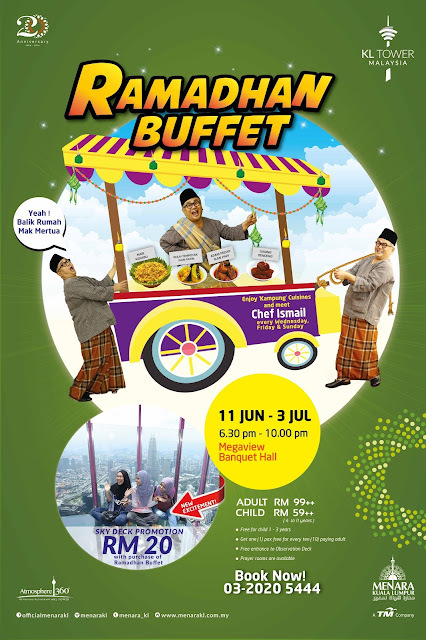 Bring your family and friends (or the entire satu kampung) to enjoy the many ‘kampung’ cuisines and many other mouth-watering delicacies featured in this KL Tower Ramadan buffet and guess what, meet Chef Ismail everyday Wednesday, Friday and Sunday to complete your “Buka Puasa” experiences at KL Tower! Here's the food journey! Feast on this before the real deal! I seldom see telur itik featured in some of the cooking but you can expect it here. I tried it and I love it, I had TWO! And the vege is soft and soaked in lemak! Dodol! Coming from Melaka, you know I will have high standard when comes to dodol! I just want to show you up-close! It's not overly sweet, yet it's soft, not too gooey that stucked everywhere! Good one! Roti jala is not hard, although it's prepared ahead and the dalca sayuran is not spicy nor overpowering. By just looking at the cili yang bertaburan already make my hearts skipped a few beats! Love prawns? Here you go! I have to compliment this. Of all, I love this the best! I LOVE ASSAM PEDAS, so far, not many place in KL offer good assam pedas! Just wanted to show how much I love the assam pedas with nasi ulam! For meat lovers, you will be spoilt with choices! I challenge you to try every single part of it! I love it, and I overheard from other bloggers, they are loving this too! And this, don't you forget this! Soft, aromatic and flavourful - this is how I describe this. I am particular with my kuih, and how this fair? It hit the right spots! Fancy some durian? Settle! Pretty good choice, it's not too sticky but it has the right amount of durian, enough for you to want second bowl. Fruits and all the kuih-muih! Got you covered if you are not into rice! I can go with anything with this! Yupe, I had 4 plates of these! Imagine!!! It is definitely worth it, especially if you are going to impress your guests and family with good food and great views! I mean... look at this! Seat by the window and you get this wonderful view, overlooking the entire KL! Exclusive or not? Meletup! The Ramadan Buffet is priced at RM99++ for adult and RM59++ for children. You can enjoy the new excitement which is the KL Tower Sky Box with only RM20 add on when you purchase the buffet. Free for children (aged 1 to 3 years old) and free entrance to KL Tower Observation Deck!!! It is, of course.... wajib to selfie with KL Tower.... regardless! Kenalah juga pose with KL Tower! We had to have the ondeh-ondeh IN! Happy to get a shot with them too! To avoid disappointment, better to RSVP before going especially if you have big group. And.... there's promo of course, with every 10 paying adults, get one (1) pax free! Oh, btw, prayer room is available as well. For more information and RSVP, please call 03-20205444 or 03-20205055, visit the website or go to their Facebook. Happy berbuka and feasting!